Checkout this awesome video the good people at AirVūz put together about SHARK's use of drones! Description: [WARNING: GRAPHIC CONTENT} SHowing Animals Respect and Kindness (SHARK) fights to protect animals from abuse and cruelty by using drones and UAV technology to gather video evidence of the criminal activity. Started by Steve Hindi in 1993, SHARK has proven to be so effective protecting animals that they've won the support from famed animal rights activist Bob Barker of TV's "The Price is Right." See how they use drones to fight corruption and change society for the better in this AirVūz News exclusive!. SHARK is a non-profit organization, to donate go to www.SHARKonline.org. UPDATE September 2018. AirVūz has put out another video featuring some SHARK footage. Check it out! Description: Sometimes while flying your drone people will confront you while you're in the air. Whether they are concerned about privacy or just curious, it is usually an unwelcome distraction. In this AirVūz News story you can learn from skilled professional drone pilots who have been accosted while flying, as they share tips on how to handle the situation from their own experience. Remember: always be polite and respectful even though you're being antagonized! It will help us all be more accepted by others in the long run. SHARK's Video Proves Rodeos Illegal in Quebec! In the summer of 2017, SHARK traveled to Canada to film 20 rodeo events in Montreal and St-Tite in Quebec. The evidence collected was the basis for a major report written by Law Professor Alain Roy of the Université de Montréal that concluded rodeos are illegal in Québec under the new Animal Welfare and Safety Act. The report has been submitted to the Rodeo Advisory Committee created in August 2017 by the Québec Ministry of Agriculture, Fisheries and Food. You can read the massive damning 610 page report and other documents HERE. A critical element to analysing the video was the expertise of Dr. Jean-Jacques Kona-Boun, DMV, MSc, DACVAA, veterinarian and anesthesiologist who helped document and review the video database of 20 full rodeos, recorded in Montreal and St-Tite. 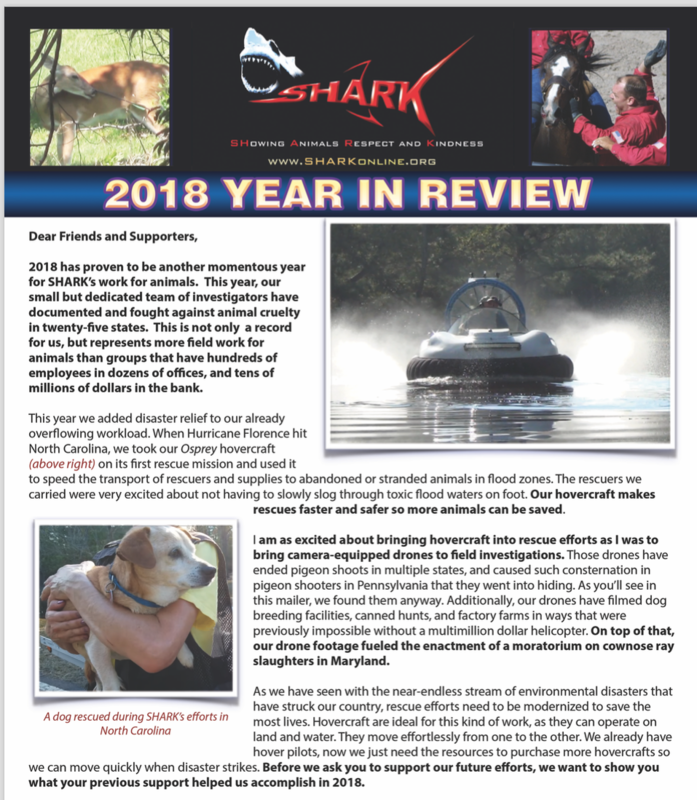 We at SHARK believe it is important to use our expertise with filming and technology to help others in the struggle to save animals lives. We are glad to be a part of the effort showing that rodeos are illegal in Québec under the new Animal Welfare and Safety Act. SHARK is the pre-eminent animal protection organization fighting against rodeos in the world. We document dozens of rodeos every year and have collected almost three decades of shocking video proving that animals are routinely injured and killed in rodeos nationwide. Our rodeo videos have received tens of millions of views on our YouTube channel. To read the entire 610 page document prepared by Clicking Here.